Come and meet the Sydney Rangers for a fun afternoon with our players and members. Rangers committee will be on hand to talk to anyone about joining the club and to introduce new comers to our players. Sydney Rangers FC provides a platform for football players of all skills and abilities to play at various competitive levels, to represent our Club with pride at both international and domestic tournaments, and always maintain a strong recreational and social focus aimed at supporting the gay inclusive community. We create a supportive team environment where players are encouraged to join our “football family” regardless of ability, age, race or sexuality and we encourage all members to build strong relationships within our community to promote a healthy, vibrant and tolerant society. Our philosophy is to accommodate players of all skill levels for those who desire to play competitive or social football. Respect for All Persons – all members are equally important and will be treated with respect and fairness. We will conduct ourselves in a manner which promotes respect for ourselves, team officials, the opposition and our supporters. Player Development – within a fun, welcoming and inclusive team environment so players can develop their skills, build life-long friendships and a keen interest in our Club and the global phenomenon that is football. Safety – we will provide a physically and emotionally safe environment for all of our players, team officials and supporters. We will provide a harassment free sporting environment. Community Engagement – to build stronger ties within our community and foster a shared sense of belonging and contribute to a positive social responsibility from all of our members. Sponsors – work closely with our sponsors to realise mutually beneficial long term goals. Identification and Affiliation – support the identification and development of gay and inclusive football in Australia and help to promote gay and inclusive identified football clubs. Promotion of Football – fostering the promotion and development of the “the world game” amongst Sydney and Australia’s LGBT community. Financial Stability – to operate a financially stable organisation and support the achievement of our long term goals. 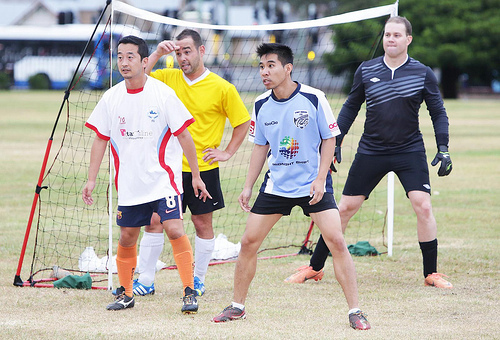 Consolidate our 3 winter comp teams with Balmain DFC – 2 all age men’s & 1 over 35s team. Grow our membership of 69 members to 80 full and social members. To establish a Player’s Code of Conduct for all members of the Club. Conduct a cost analysis for the creation of a Rangers app across apple and android platforms as a resource tool for the management of upcoming games and disseminating all club information. Build the financial position of Rangers to enable the combined support to run PFA Sydney 2014 in conjunction with The Flying Bats. We propose the joint working group of 3 Rangers and 3 Bats. Sydney Rangers FC will maximise all PR events that can benefit the image of the Rangers brand (eg Fair Day, Mardi Gras Tournament, Mardi Gras Parade, etc) and to provide a return to members such as the End of Season Gala Event. Provide assistance and support to prepare for the next international tournament in 2015 and provide any support needed to help our team get to the Cleveland/Akron Gay Games in 2014. Keep a minimum cash balance of $10k as a base savings figure to safe guard the financial future of our Club. Develop a fourth winter comp team. Increase our membership to 100 full and social members. Participate in the full establishment of PFA as a separate entity as a condition under which we operate. To build, foster and pursue relationships with Football Federation Australia (FFA) and Sydney FC to achieve our mutually beneficial long term goals. We hope to build on the excellent work by the Sydney Convicts who succeeded to get all major sporting codes including FFA to sign the Anti-Homophobia & Inclusion Framework for Australian Sports. When the Club’s financial position is greater than $10k (minimum cash balance), we will liaise with our membership via a members’ survey to assess how the money is to be spent. To position the Sydney Rangers brand as a competitive and comparable brand to rival other like sporting teams in Sydney, Australia and internationally. The Sydney Rangers Football Club Inc hereby advise that their Annual General Meeting will take place upstairs at ACON, 414 Elizabeth St, Surry Hills at 7.30PM on Tuesday the 22 April 2014. (e) the Sponsorship and Fundraising Officer. Only Life Members, financial Full Playing Members and financial Social Members may be elected to the Committee. Such members wishing to be elected to one of the above positions will be required to submit either the President or Committee nomination form to the Secretary and Returning Officer via email returning-officer@sydneyrangersfc.com.au no later than 4pm Saturday 19 April 2014. If insufficient nominations or nominations equal to the number of positions are received to fill all vacancies on the Committee, the candidates nominated are taken to be elected. Members wishing to offer a Proxy can do so using the attached form. Only financial Full Playing Members, financial Social Playing Members and Life Members may vote on the election of the Committee and on any resolution put to a General Meeting, including Special Resolutions. The attachment below provides the proposed Special Resolutions to amend the clubs constitution. The Rangers celebrated this year’s annual Sydney Gay & Lesbian Mardi Gras parade in style with a spectacular tribute to the 2014 World Cup in Brazil with the “All Roads Lead To Rio” carnival float. Sydney Rangers sends a massive, heart-felt thank you to Daniel Amoafo for putting this video together! Even though the rain threatened to pour all night, not a drop fell from the sky on the biggest Mardi Gras parade in participation numbers to date. The Brazilian samba spirit was truly alive on Oxford Street as the Rangers and their friends showcased an energetic and vibrant choreographed dance routine complete with football-painted maracas. Rangers teamed with renowned parade choreographer Laurence Stark and professional Latin dance troupe, La Fiesta Entertainment, dancing the night away to a mashup of the world cup anthem and Brazil’s most famous song, “Mais Que Nada”. The Club has received much positive feedback from our parade entry this year and would like to thank the tireless work of the committee, all the parade entrants for giving their time at rehearsals and for making the party atmosphere a positive one full of love. We look forward to Sydney Rangers celebrating many more mardi gras parades in front of our adoring community.